Early this past Friday morning, fueled by coffee and bagels, Evan and I loaded the last of the gear in the car and the bikes on the new roof rack, and set off eastbound, ready for a weekend of exploring new territory, outdoor adventures, and an evening of great live music with our friends Steve and Tammy. We were headed to Jim Thorpe, PA to see the band Cabinet (who, by the way, was fantastic—definitely check them out if you’re at all into bluegrass), and the plan was to mountain bike in that area on Friday before the show and all day Saturday. It turned out that the snow there was too deep to ride the areas we had wanted to, so we amended the plan a bit and decided to meet up at Swatara State Park instead, which was on the way to Jim Thorpe. 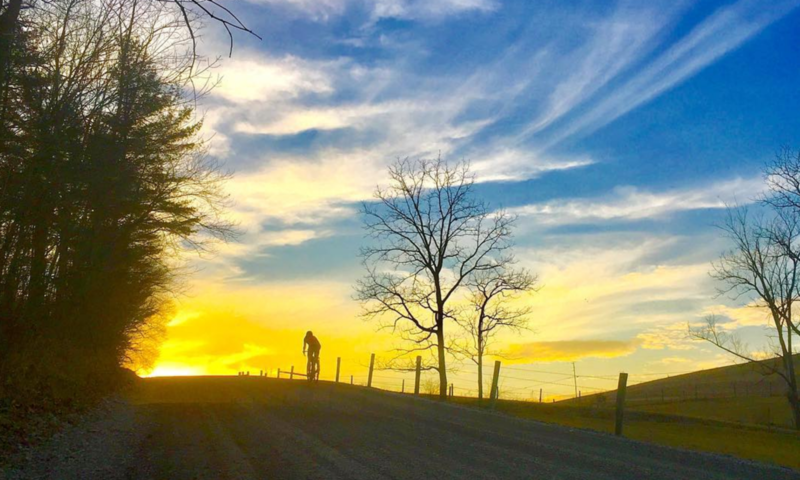 Swatara’s mountain bike trail system is made up of six interconnecting short loops, totaling approximately 10 miles of flowy singletrack that winds through mixed forests and over small streams. This weekend, the trails were still encased in snow, but it was a rideable crust in all but a few areas. It was still cold when we started out—in the mid 20s—but we warmed up quickly and so did the air, and soon temperatures were climbing into the 30s. It took me some time to get used to riding on a trail again—deep snowpack has rendered the trails back home unrideable for the past few weeks, so the little bit of riding that I’ve done lately has either been on the flat ice of the lake or the road. I felt awkward and clumsy and a little bit lacking in confidence as I navigated the ruts left by frozen footprints on the more popular trails closer to the parking lot. Dropping tire pressure, and then dropping it some more helped immensely, as did time on the bike to get used to riding singletrack again. This was also my first ride testing out the Thompson titanium handlebars I had put on a few days before. I “won” the bars at last years Dirt Fest by riding over a group of guys on a Mukluk (yes, true story), and they’ve been sitting around for months since. But recently I decided to give them a try, and I was curious if I’d notice a difference in flex or feel. The jury is still out on that one—I’m going to have to ride them in a variety of conditions and on some familiar trails once the snow melts to make any definitive judgement on noticeable differences or whether I like them or not. Stay tuned for that verdict. At one of the streams, we stopped for a break, and over a snack of deer jerky, Steve and Evan began eyeing up a log crossing. The approach was sketchy, as there was no clean, straight line to get onto the log, so the first few attempts were thwarted fairly quickly. There were quite a few step-offs, some of them graceful, some of them not, and a couple of them ended with the bike in the water. Steve finally made it across, and Evan decided enough was enough after fishing his bike out of the stream, water pouring from his pogies. We ended the ride just as the snow began to turn to a granular slush, and basked in the midday sun, marveling at the ability to stand around in our riding attire without becoming immediately chilled to the bone, before making our way up the highway to Jim Thorpe for the next part of our weekend. For more information and latest updated trail conditions at Swatara State Park, visit the Susquehanna Area Mountain Bike Association. Previous PostPrevious We made it.